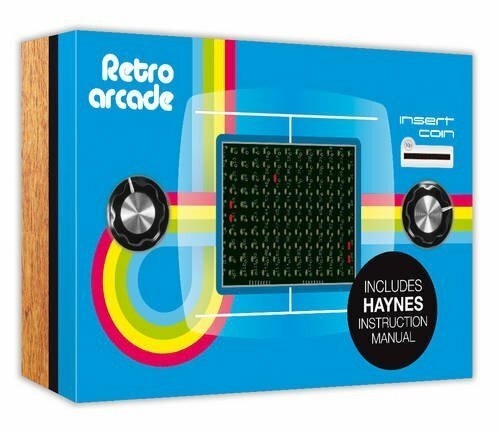 Perfect for Makers, STEM enthusiasts, or the true retro gamer, the Haynes Retro Arcade Kit allows you to construct your very own handheld version of an arcade classic. The kit’s box doubles as the arcade housing, and contains all the necessary components for you to construct your first DIY arcade cabinet. Beginners can learn the foundations of electronics, and practice soldering by connecting variable resisters, circuit boards and the battery board. More advanced Makers can do custom builds off of this foundation. Experience Pong with original 2-D graphics on the 120 red LED display. Complete your project with the realistic controller knobs, and coin slot. Increase the level of difficultly (five total) and the speed of the ball, and play all day. Play against the computer, or challenge a friend to a couple of games. The cabinet displays the score and the first to reach 10 points wins the game. Don’t let a loss deter you; insert a coin for an immediate rematch. For those familiar with microcontrollers, this kit has limitless potential. The unused connections on the circuit board are perfect for creating your own projects. Included housing keeps your kit protected, but you could build your own custom design. The possibilities are limitless! Please note, hacking this kit is not recommended for those unfamiliar with microcontrollers, as the system can be damaged. The kit comes with a Haynes Manual, complete with the step-by-step instructions, illustrations, and high-quality images you have come to expect from Haynes. This kit requires a soldering iron and wire cutters (not included).